Medicine, as the art of preserving and restoring health, is the rightful office of the great army of earnest and qualified American physicians. But their utmost sincerity and science are hampered by trying restrictions with three great classes of people: those on whom the family physician cannot call every day; those on whom he cannot call in time; and those on whom he cannot call at all. To lessen these restrictions, thus assisting and extending the healer's work, is the aim of the pages that follow. Consider first the average American household, where the family physician cannot call every day. Not a day finds this household without the need of information in medicine or hygiene or sanitation. More efforts of the profession are thwarted by ignorance than by epidemic. Not to supplant the doctor, but to supplement him, carefully prepared information should be at hand on the hygiene of health—sanitation, diet, exercise, clothing, baths, etc. ; on the hygiene of disease—nursing and sick-room conduct, control of the nervous and insane, emergency resources, domestic remedies; above all, on the prevention of disease, emphasizing the folly of self-treatment; pointing out the danger of delay in seeking skilled medical advice with such troubles as cancer, where early recognition may bring permanent cure; showing the benefit of simple sanitary precautions, such as the experiment-stations method of exterminating the malaria-breeding mosquito. 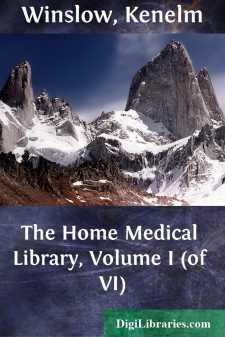 The volumes treating of these subjects cannot be made too clear, nontechnical, fundamental, or too well guarded by the supervision of medical men known favorably to the profession. Again, the physician cannot come on time to save life, limb, or looks to the victim of many a serious accident. And yet some bystander could usually understand and apply plain rules for inducing respiration, applying a splint, giving an emetic, soothing a burn or the like, so as to safeguard the sufferer till the doctor's arrival—if only these plain rules were in such compact form that no office, store, or home in the land need be without them.